Perimeter, black-out, mirror or stage curtains, whatever you need. 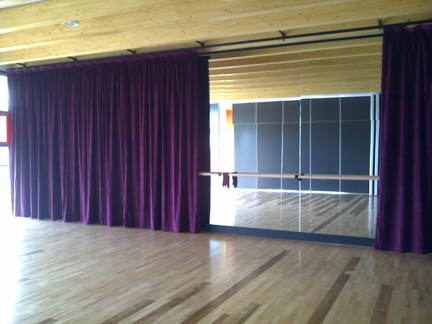 Whether you are looking to cover-up some dance studio mirrors or create a 'black box' environment in your drama studio, our Duratrack Curtain Systems will provide the ideal solution. 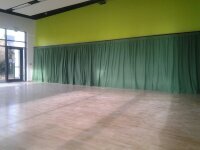 Whilst mirrors are a necessity for dance, they can be an unwanted distraction during certain lessons or exams. A set of our Duratrack Curtains will help eliminate any distraction and provide a warm finish within the studio. Our Duratrack System features smooth-glide rollers which provide easy manual operation for the opening and closing of the curtains. 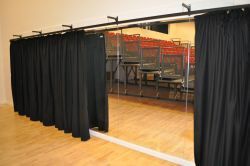 The Duratrack System can be installed over existing mirrors and positioned to fall either in front of or behind a ballet barre. Where a heavier-duty curtain track and system is required, our Duratrack Plus fits the bill. 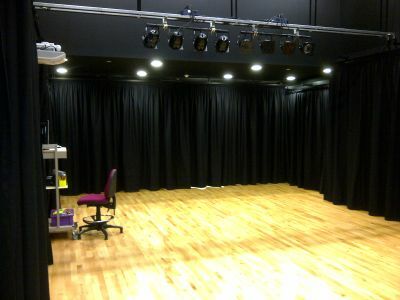 We provide a full range of stage and perimeter drama curtains for situations where either additional acoustic properties might be needed, to create a black box environment within a studio or for a 'blackout' situation to ensure your studio is kept in the dark. All Duratrack Systems are available for wall or ceiling mounted situations and can be manual, motorised or winch-operated as needed. Our Duratrack curtains are available in a wide range of colours and fabrics and we are sure there will be one to match your surroundings.